Earlier this month, for the first time in my seven years of blogging, my site crashed due to traffic. But the really crazy thing about the post that went viral: it was an old post. I’d updated it and pinned it. And then ish got real. As I type, that post has 492,195 views. That’s more than I usually get in a month; it’s helped me land 1,000+ new subscribers and hundreds of dollars in ad revenue. If that’s not reason enough to update your old posts, here are more! When I started blogging 1,000 years ago I knew how to write …. and that’s about it. I didn’t understand SEO. I didn’t know how to make my images Pinterest-friendly. Hell, I’m sure I used copyrighted images because I didn’t know I shouldn’t! The longer you blog >> the more you learn >> the better you get. I’m sure you have old posts that are built around good ideas. It’s just that those ideas are wrapped in enormous paragraphs, illegal photos, and terrible SEO. Give those ideas a chance to live + breathe + reach new people! In 2007, it was common/clever to use song titles, lyrics, or funny non-sequiturs as blog titles. We could center justify 200 words in one long paragraph and call it a day. I’m sorry to say, that ish doesn’t really fly now. Readers want obvious, helpful titles, in-depth tutorials, short + readable paragraphs. Thankfully, it’s not hard to rework old blog posts to meet today’s standards. I happen to think that I wrote some pretty useful stuff in 2008, but if I don’t promote it or link to it in newer posts nobody’s going to know about it. Most of us have our archives memorized – but that doesn’t mean our readership does. I’m sure you’re adding new followers and subscribers every day; make it easy for them to fall in love with your old stuff! I started blogging when I was 27. Since then, I’ve traveled to 12 more countries, left my career in education, worked with hundreds of clients, walked away from a book deal, moved, gotten married, and become a stepmom. Not surprisingly, these changes have given me All Sorts Of Insights into things I wrote about in the past. I have so many things I’d like to add to those posts about what to pack and how to get the love life you want! I’m sure you’re the same. Tuck some of that fresh wisdom into old posts! Sooooo many of my old posts include links to services I no longer offer! Quelle horror! And the older posts that tie into the services I currently offer don’t mention that. Like, at all. You too? Let’s change that. I have, somewhat ridiculously, 2,000+ posts in the Yes & Yes archive. Not all of those posts are created equal! If you have a huge back catalog as well, this will help. Tax season is rearing its ugly, complicated head; update your post about taxes and freelancers. Update your post about Spring Break destinations, recipes for Easter brunch, or St. Patrick’s Day cocktails. You get the idea! We can’t always control which posts get the most traffic (my sixth most popular post is an interview with a woman who has herpes). Even if that’s not the post that I like the most, it gets hundreds of pageviews every month. I may as well make sure it’s nicely formatted, SEOed, and links to other posts. Are you offering Instagram mentoring? Go back through your archives, find all the posts that relate to Instagram, update, and re-promote them. Is your new brunch cookbook about to come out? Update all your posts that feature brunch recipes. Etc, etc. forever and ever, amen. What’s a content upgrade? It’s a little ebook, a checklist, or a resource that lures people into joining your list. Usually, a content upgrade is specific to one blog post; it’s written to compliment the topic addressed in that particular post. But! If you’ve created a content upgrade that’s applicable to lots of posts, update those old posts to include the upgrade and then re-promote the posts. I created this content upgrade about romantic relationships and then I tucked it into this post about things you should say to your partner, this post about setting realistic relationship expectations, and this post about moving in together. I promoted all of those posts around Valentine’s Day and got 250 new subscribers! Download Grammarly. Print the post out and proofread it backward, sentence by sentence. Lose the obvious, trite turns of phrase. Keep your paragraphs short – no more than five lines long. Run the headline through Headline Analyzer and edit accordingly. Add a question at the end of the post to make it more engaging and more likely to elicit comments. If there are only a few links in the post, it’s easy to check them by hand. If you’re feeling brave, run your whole site through Brokenlinkcheck.com. The results are horrifying/awesome. I only started caring about SEO mortifyingly recently and I’ve almost doubled my page views. Crazy, right? Yoast is understandable to us plebians and offers great customer support with tons of tutorials. A few things I can tell you right off the bat: add title text to all your photos (that’s the text that auto-populates to Pinterest when people pin your stuff). Use H2-sized font for your section headers. If you top all your blog posts with an image, don’t embed a link in that photo; embedding a link tells Google that link is the most important thing in the article. What’s changed since you originally published this post? Have you found any new apps that help solve this problem? New beauty products? New kitchen gadgets? New epiphanies? But you knew that already, right? You know the deal: tall, long, pretty image. Keyword-rich description. Pinned to a topic-related group board. BOOM. Done. Here’s a great roundup of free images for bloggers. Maybe you wrote that post about Twitter in 2010 and since then, you’ve written about Twitter three more times. Link to those later blog posts! If you can’t find a way to work links into the body of the post, just tuck them into a P.S. Even if you use a ‘related post’ plugin, P.S.’s can be really effective. People get ‘blind’ to those plugins and they don’t show up in RSS feeds where most people read blogs. 93% of the most popular social media updates include images. I’m sure you’re already including images in your Facebook updates and obviously on Instagram, but did you know you can include images in your tweets? Download the Twitter Cards plugin, upload a 1038 x 675 featured image and it’ll show up in all of your tweets! Is your post as awesome as humanly possible? Wonderful! Now share it on all your social media profiles. Schedule an update on Facebook (at 9 am, 1 pm, or 3 pm – the busiest times on Facebook). Post it to Twitter, Instagram, Google+ or LinkedIn. Pin it again. Paste a link on their Facebook page telling them how much you love them and that you’re talking about them. @mention them. Send them a real, live email. Maybe you’ll make a new internet friend! Maybe they’ll share the post! They won’t be able to share it if they don’t know about it. Whew! I know that’s one metric ton of information and lord knows I’ve still got puh-lenty of posts in my archives that could be polished and honed. But it’s worth it! Promise! 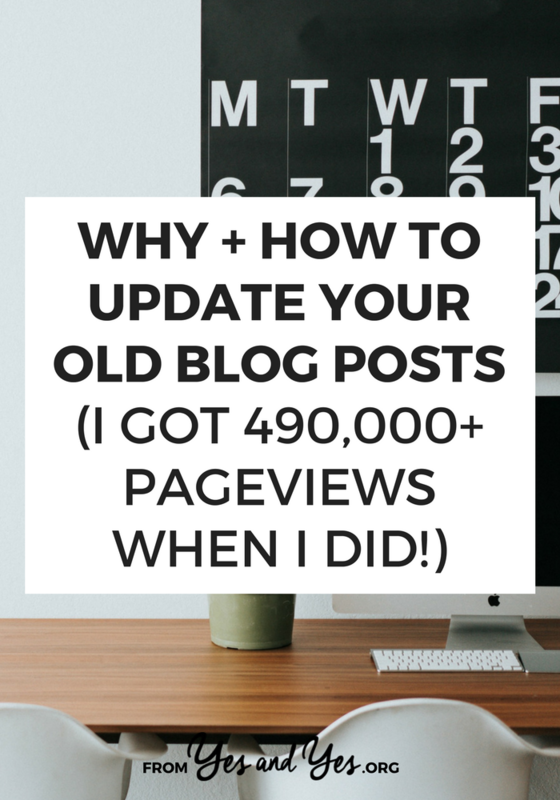 Do you make a practice of updating old blog posts? If you do, how do you update them? And what do you do? You don’t have to be failure-proof. That’s not a thing. Wow, Sarah. That was such an epic and helpful post and I will definitely use these tips ASAP. I have quite a few posts on my blog that would need updating. Especially the SEO, links and images. So glad you found it useful, Tiasha! Can you do all of this for me? For a fee, of course. Some great tips. Thanks, Sarah. I’m going to note date-specific content, such a friend’s piece on the Day of the Dead, in my calendar for reposting at the appropriate time. Hi Sarah, What do you do about old, thin posts from way back that are not worth updating. Should I delete them or just remove from my navigation? I’m not an expert, but I’d see if they have any incoming links. If they do – leave ’em. If not, you can certainly delete them if you want to! Also, Sarah if a post is very old and you update it, what do you do about all the old comments from way back. I find if I leave them, this confuses readers. Good question! Honestly, I just leave the comments up – I haven’t too much trouble with it. This is SUCH smart advice! I never would have thought of this. Clever girl! This isn’t gold indeed! Thanks for breaking all of that down! I began updating all my old posts in January, this year. Great minds, no? I began a second blog site awhile back because so many of my posts were off topic. Can’t help it–got so much to say, ha! The new one is the goal, to get it’s posts off the old one, spruced up, fixed, etc., like you said. This post is so timely for me. Thanks for the link to the broken link fixer thing. I used it once, eons ago, and forgot where it was. I know I have tons, and you are right–it will require bravery to go there, but it is so, so needed. Does moving my posts to my second site dim my seo? or should I maybe rewrite them? Thanks in advance for your answer!!! Hmmm, I’m not an SEO expert but I *think* if you forward the post using a plug in you’ll be fine? This is great information – thank you! One problem I’ve recently run in to is having an error come up when trying to pin some things from my page and I noticed it on some of yours too. It comes up with: ” Oops! You need to upload an image or provide the ‘image_url’ parameter” Is this an error on my part or with the actual pictures? Hmmmm, I haven’t encountered that before! Sorry I can’t be of more help! Such a helpful and comprehensive post. I often feel that I would like to reuse old posts but wasn’t sure of the best ways. Thanks to you I’ve picked up quite a few ideas thank you. So glad it was helpful for you, Sandra! I guess this is an example of an older post that has been revisited… It’s not that old, but here I am 5 months later reading it. In any case, great tips and ideas. I have only been blogging for about a year and a half, but I’ve often wondered about revisiting and reviewing my old posts… I think this information will be the push I need to go through the old posts and spruce them up a little. I reposted a blog about an Etsy product before Father’s Day. This is the most helpful post I’ve read regarding blogging in some time. It was concise and easy to take away content from. Thanks! So glad you found it helpful, Christa! We do update our old posts especially if we have “discovered” a new way on how to make our content more appealing to the readers. Hi .Sarah i agree with you…….? we can get magical traffic by only updating the old post. Every bloggar must know about this. Thankyou very much for sharing this great & useful info. with us. Hey, ironically, a bunch of your images aren’t showing on this post! 🙂 I’m on Chrome, if that helps. Thanks for all this info! Love this! Super helpful. I used to blog more regularly, but have been focused on my newsletter the last few years, and getting ready to get back into blogging. Quick question: Do you edit/update the post, but leave the original date on their so that it’s stays in the archives in the same chronological place? OR do you create a completely new post that repurposes some/most of the old content that has the current date, and then end up with two similar posts on your blog? Also, do you recommend repurposing/republishing posts from your own blog to LinkedIn and Medium? Is there a specific strategy to that? I don’t replicate the post because I thiiiiink it might have a negative affect on the SEO. I’m not positive but I think so. I haven’t republished stuff to LinkedIn or Medium but I’ve heard that recommended before and it certainly makes sense! This is so awesome! I think I’m going to be obsessed with the Headline Analyzer! Thanks so much for sharing and writing this. IT has been truly helpful. I have to say I absolutely love this! This is a perfect tip to keep in mind down the line as I grow my blog! Thanks! Hi Sarah – Do you change the publishing date of the post when you update it? I know that Google recently updated its algorithm to favor more recent posts, but something about changing the date feels a little like deceitful. Am I being overly sensitive? Should I just add a line at the bottom that says “This post was originally posted on [Date]” and be done with it? This post is amazing, by the way. Thank you for taking the time to write it! I don’t change the date or add a line at the bottom. I don’t republish the post perse, just update the content and re-promote it. I don’t know the nitty gritty of it, but I’m pretty sure actually republishing old content is bad for SEO.